Two men are sitting in an anteroom as a door bangs incessantly. 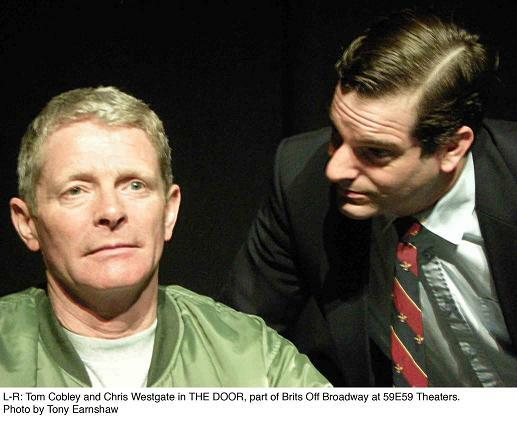 The story they unwind in Tony Earnshaw’s “The Door,” part of Brits Off Broadway at 59E59 Theaters running through December 11th, seesaws in search of the truth. “The whole system collapses if you don’t obey orders,” Boyd tells Ryan. Ryan’s answer is “The whole system is pointless if you do.” What appears to be random disagreement over politics, tabloids news, and the existence of God, turns out to be very personal. Ryan (Chris Westgate) and Boyd (Tom Cobley) are waiting to justify an incident that happened during their service in Iraq. is a refrain that gets passed from hand to hand as the noise unnerves each man in turn. 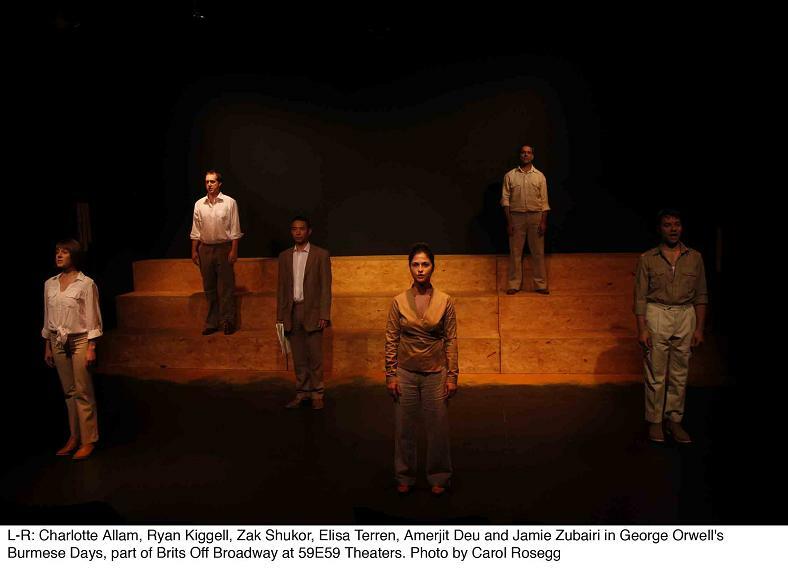 The taut fifty minutes play, under Anna Adams able directions, goes from Beckettian absurdity to a surprising animated ending. 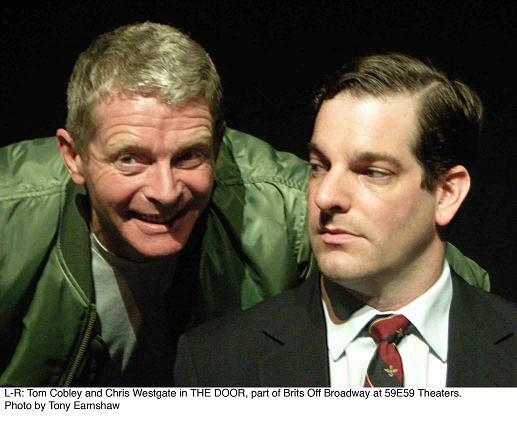 For more information on Brits Off Broadway and a schedule of performances for “The Door,” visit www.59e59.org. Does it matter if Will’s the author? Does the film “Anonymous” have you pondering who wrote all the works ascribed to one William Shakespeare? Consider the argument irrelevant. Whoever wrote the sweeping tragedies, masterful histories, insightful comedies [and a handful of clunkers], left a worthy legacy. He wrote as an Elizabethan, aware of his time and its mores, with wit and a deft hand at characters great and small. But more on that anon…. This theater season, there are a number of fine productions celebrating that legacy. 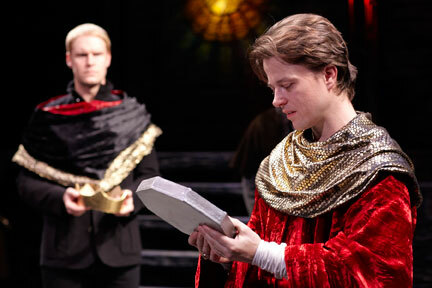 The Pearl Theatre Company at City Center’s Stage II is tackling the poesy of “Richard II” through December 24th. It’s an ambitious, if uneven effort, looking at the divine right and mortal plight of kings. of ruling unwisely. 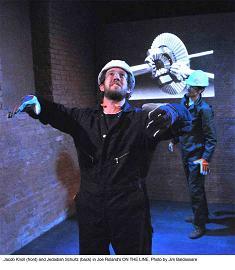 In the title role, Sean McNall portrays a monarch unhinged by the challenge to his absolute authority by his cousin Harry Bolingbroke (Grant Goodman). Bolingbroke is a populist leader but sometimes Goodman’s affect seems too modern for the verse play he inhabits. This Bolingbroke is definitely lean and hungry. 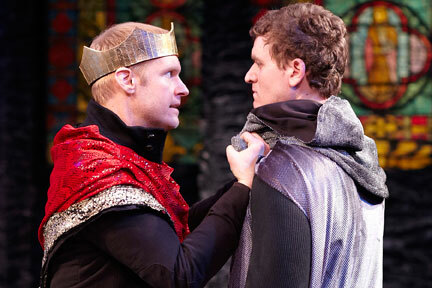 Dan Kremer as John of Gaunt, Earl of Lancaster, Harry’s aggrieved and grieving father is excellent. Under JR Sullivan’s direction, the cast handle the poetry as if it were prose. That is smoothly, and without any sense of awkwardness. Elsewhere around town, at The Barrow Street Theatre, Fiasco Theater performs a completely modernized and raucous version of “Cymbelline” through January 1. 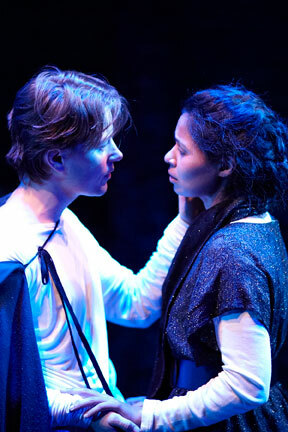 Fiasco Theater has transformed one of Shakespeare’s lesser works into an excellent entertainment. Also downtown at The Public, “King Lear” has just ended its run with Sam Waterston in the title role leading a brand-name cast. 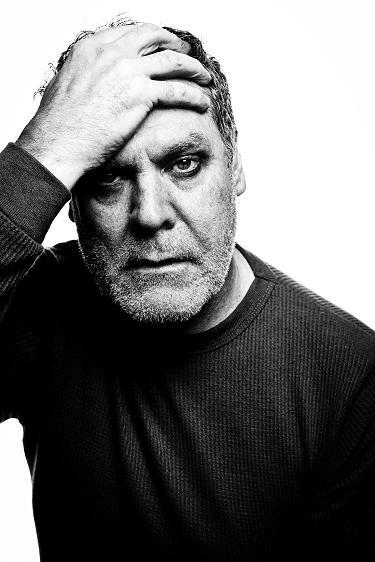 “Titus Andronicus” begins performances on the 29th of November through December 18th at the Public Lab and features Jay O. Sanders as Titus. 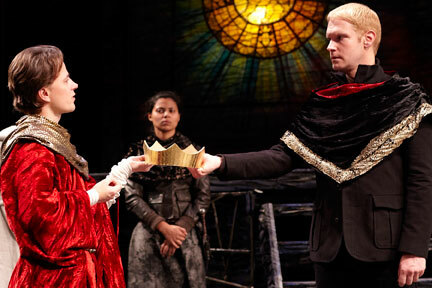 Looking forward, there is the January 10, 2012 opening of The Bridge Project production of “Richard III” with Kevin Spacey as the titular monarch under the direction of Sam Mendes at BAM. So, back to the question– does it matter who wrote these plays? Is it realy of concern if they were writ by an unknown hand unwilling to take credit for an enduring body of English literature or by an actor named William Shakespeare? The canon is vast and eloquent. It lends itself to the spoofery of The Complete Works of William Shakespeare (Abridged) and the serious ministrations of actors and directors the world over. It has drawn the attention of your highschool English teacher and spawned rom-com plots for decades. The dramas attract filmed homages ranging from Kirosawa to Woody Allen. In short, Shakespeare survives critical analyses and debates over who he was and what he may have been capable of doing. More importantly, all these centuries later, he offers deep and sustaining perceptions into our lives. 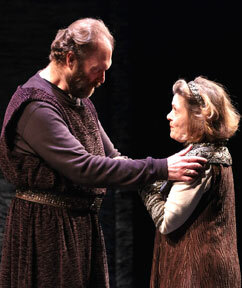 For more information about The Pearl’s production of “Richard II”, please visit www.pearltheatre.org. Long before George Orwell envisioned a world in which Big Brother would supplant our freedoms, he was in His Majesty’s foreign service. There he saw the despotism with which his countryman lorded it over the natives. 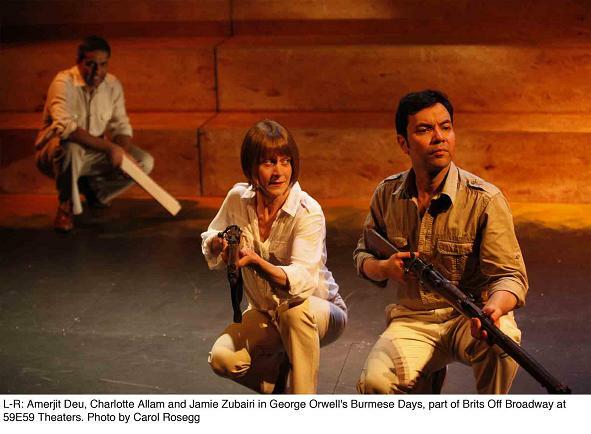 In “Burmese Days,” adapted and directed by (and featuring) Ryan Kiggell in an aya theatre world premiere production at 59E59 Theaters as part of Brits Off Broadway through December 4th, Orwell explores the intrigues and petty territorialism of a British Club in colonial Burma. By 1934, the hot sun of the Empire had begun to set. Orwell’s first novel, “Burmese Days,” catches its last few rays before it fades as the inhabitants of Kyauktada squabble and drink. The cast of six, featuring along with Kiggell, Charlotte Allam, Amerjit Deu, Zak Shukor, Elisa Terren, and Jamie Zubari in a variety of roles, relates the tale, and embodies characters (and critters) in the tropical land. The political machinations and petty rivalries in this small provincial world are depicted with admirable exactitude. 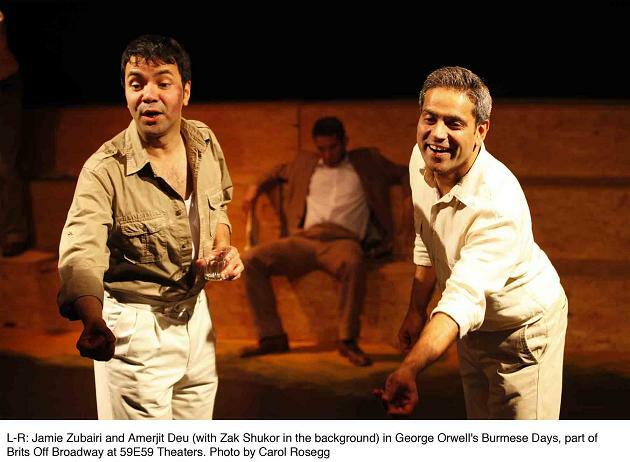 “Burmese Days” is an interesting theatrical work, that is both a play and a series of monologues and narrations. “The Maddening Rain” is as much about knowing who you are as it is about greed and ambition. In “The Maddening Rain,” a solo show in repertory in Theater C at 59E59 Theaters through November 20th, a young man (Felix Scott) of working class background, dressed in business attire, is clearly a lost soul. The man looks to find himself and aspires to more, more money, mostly. After a series of odd jobs, ambition and greed bring him to the perfect place– a securities trading floor. One man shows are a feat for any actor. Felix Scott admirably rises to the occasion. His deft portrayal of a variety of characters is interesting and noteworthy. In a particularly exciting scene, his character convincingly holds an argument with his boss Andy. The enticing set design by Alison McDowall with lighting by Emma Chapman and video projections by The Bidd Group turns the small stage into a panorama of city windows. It’s all about love and juggling! Perfect Catch,billed as “Throw-mantic Comedy” at Canal Park Playhouse through November 27th, follows the formula set by Hollywood for romantic comedies. Boy and girl meet, but they don’t really like each other and, then suddenly, something happens to spark an interest, and finally, they are in the throes of an endearing love. The juggling umbrellas set to “Singing in the Rain” create a little peril for our lovely duo, he a little nerdy, she poised and glamorous. Meanwhile, Nina Conti does an altogether different brand of throwing. She is a world renowned ventriloquist enjoying her United States debut in “Nina Conti Talk to the Hand” at 59E59 Theaters in the Brits Off Broadway festivities for one week only through November 13th. Nina Conti with her several character puppets has won awards for comedy from the BBC and the Barry Comedy Award at the Melbourne International Comedy Festival. Be warned, this is not a child-friendly show. Not that there’s anything wrong with children. You may want to keep them away from the X-rated shenanigans of Monkey. Nina Conti is attractive and charming, and has a disarming way of laughing at the jokes she is about to tell through her puppets. Sometimes a small provocation can turn into a deadly, roiling mess. 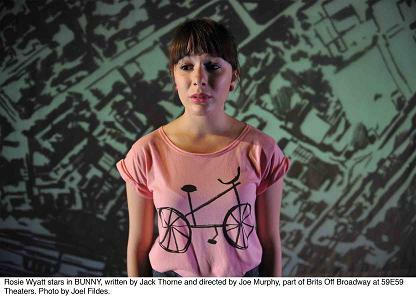 In “Bunny,” in repertory in Theater C at 59E59 Theaters as part of Brits Off Broadway through November 20th, it takes almost nothing for things to deteriorate. 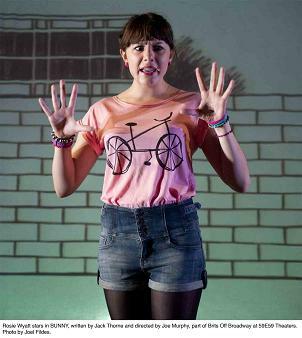 Katie (Rosie Wyatt), a vindictive, insecure eighteen year old, goes along for the ride as her boyfriend Abe, goaded by his mates Asif and Jake, look for revenge on the kid who knocked an ice cream out of Abe’s hand. The one woman play is a stunning success for Rosie Wyatt as she narrates the tale, alternatively shrinking with embarrasment or bold as brass. As Katie, Wyatt rambles on, describing the three men, her sexual history. She relates the desperation of Luton, the town in which she lives, her father’s ambitions for her. She mimics the exchange between Asif and Abe about the incident that started the chase. It becomes clear, as her stories unfold in “Bunny” that she, like Asif, exacts a measure of vengeance for even the slightest slight. Katie understands the rage that seethes in Asif as he eggs Abe on. Rosie Wyatt, the 2010 nominee for Britain’s Spotlight Prize for this role, ably carries this odd character study of an odd character. Her ability to hold our attention is a tribute to her talents, as ultimately Jack Thorne’s “Bunny” goes nowhere; like purposeless anger, it revs itself up and then fizzles. “Shadow Boxing” is a another solo show about an odd and angry character. 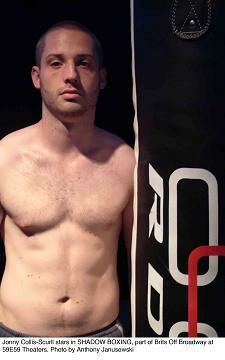 “Shadow Boxing,” is in repertory with “Bunny,” and also in Theater C at 59E59 Theaters through November 20th. Flynn (Jonny Colis-Scrull) is looking to avoid his father’s legacy of mediocrity. Like his dad, Errol Sebastian Flynn, he’s a boxer. Unlike his dad, he’s got a shot at a title match. Also unlike his dad, he hides a secret that may unravel his promising career. Colis-Scrull’s Flynn is brusque, and charismatic. Playwright James Gaddas’ “Shadow Boxing” is a compelling drama about a man looking for gentleness and kindness in the unlikely and unyielding environment of a boxing ring. 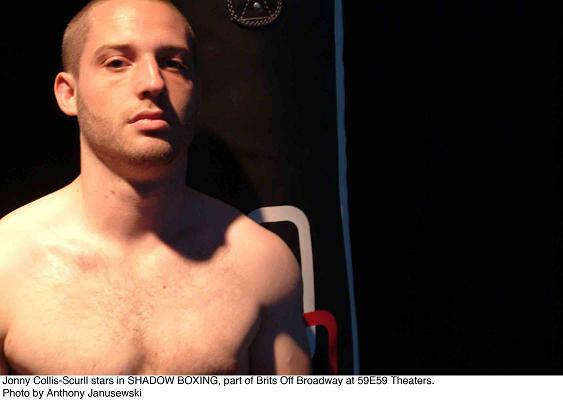 For more information and schedules for “Bunny” and “Shadow Boxing,” go to www.59e59.org. Three men find their loyalties rattled and their friendship shaken when a strike in the plant at which they all work unravels their relationship. defined by where we come from and what we do. Dev has been best friends with Mikey (Jedidiah Schultz) and Jimmy (Matt Citron) since first grade. They work together at Mr. Dolan’s plant,and after work, they drink together at Moody’s bar. Jacob Knoll, with a strong working class New England twang, is superb as the troubled, enraged Dev. At several points, Knoll’s voice tightens as Dev begins to lose his sense of himself. 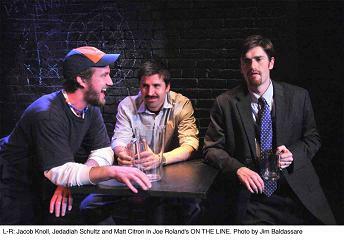 Both Matt Citron and Jedidiah Schultz are extremely talented actors and very convincing as his buddies, Jimmy and Mikey. Michael Tisdale’s directs with a deft understanding. When the plant is shut down by a strike, Dev’s grit is tested in the course of “On the Line.” He is a working man, and a working man has to work to be a working man. If he knows who he is, he has to stubbornly stick to that principle at any cost. This production fills the small 55-seat space at the Canal Park Playhouse beautifully, using sound (by Colin Alexander) and projections (designed by Ryan Dickie under the Technical Direction of Vadim Ledvin) to add mood and depth.